The Republicans of the 115th Congress and Trump have not accomplished much in the way of landmark legislation this year, unless you count overturning President Barack Obama’s achievements. And on that front, they’ve been prolific. In Trump’s first four months of office, he and Congress have completely eliminated 14 rules issued Obama—rules ranging from things like protecting Americans from coal waste in drinking water to blocking individuals with severe mental illness from buying firearms—using the Congressional Review Act. And lest you think that headache of a legislation that had only been wielded once in 21 years before now might be going away anytime soon, think again. Congress has targeted at least 31 rules in just 11 months, including the ones that have been nullified already, according to a report prepared by former senior staff member of the Congressional Research Service, Curtis W. Copeland. Those that have not been disapproved have been introduced to the House and await further action. It’s not enough to just remove the rules, this Republican-led Congress and Trump want to nullify these acts completely, as if they never took place. To do that requires a joint resolution by a simple majority in each house of Congress, which is easy for this current legislative branch. After 60 legislative days, Trump can sign the resolution into law and nullify the previous rule. But once undone, it’s not easy to reinstate a rule removed by the Congressional Review Act, which is written so that essentially a new law is required to reinstate a new or similar rule like the one that was removed by it. And that is how people like influential ex-White House strategist Steve Bannon and pollution advocate Myron Ebell, who was in charge of the blueprint for the transition and transformation of the Environmental Protection Agency, crafted this deregulation regime that could take years to undo once Trump leaves office. The Congressional Review Act was part of former House Speaker Newt Gingrich’s Contract with America and signed into law in 1996 by President Bill Clinton. Before Trump took office, the Congressional Review Act was only used once before when the 107th Congress overturned a rule by the Occupational Safety and Health Administration. The rule addressed ergonomic injuries in the workplace. Oil Company Foreign Payment Disclosure Rule: Forced oil companies to disclose payments to foreign governments. The Stream Protection Rule: Enforced regulations on coal mine operators to protect streams and other water sources from coal waste. Workplace Injuries Rule: Required employers to maintain accurate records of serious workplace injuries and illnesses for up to five years. Gun Control Amendment: Required the Social Security Administration to provide instant information to the National Instant Criminal History Background Check System on individuals meeting certain criteria, including severe mental health issues, that would prevent them from being able to purchase a firearm. “Time and time again, Republicans have abused the Congressional Review Act to appease the extreme right wing of their party and ensure giveaways to corporate special interests,” top Senate Democrat Chuck Schumer (D-N.Y.) said in a Politico article. It was thought there was a finite window for the Congress and Trump to employ the Congressional Review Act, which was previously considered a vehicle to undo so-called “Midnight Regulations” of an outgoing administration. The consensus was Obama actions only back to 2016 could be undone. That may not be the case. Technically, Congress can go back over unsubmitted agency rules, too—all the way back to 1996—and belatedly submit them for disapproval. Thousands of rules and regulations could be up for disapproval. 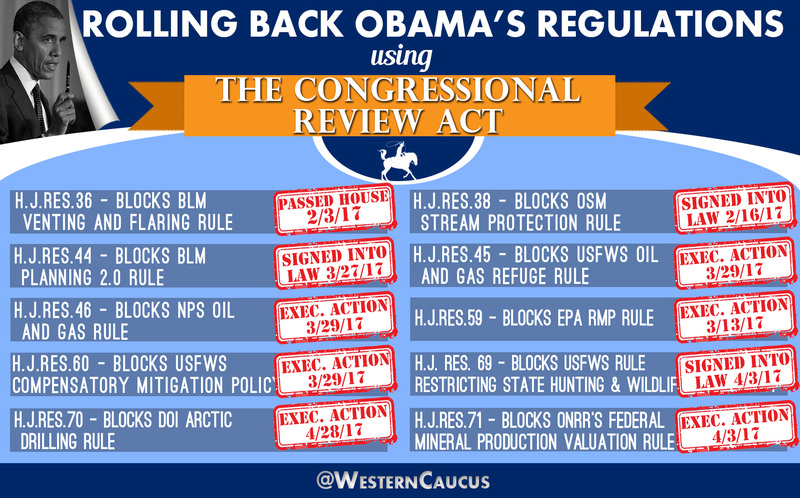 In May, Senators Cory Booker (D-N.J.) and Tom Udall (D-N.M.) introduced a bill to repeal the Congressional Review Act. It’s unlikely the Republican-led Congress will give up its most powerful tool anytime soon. At least not before the 116thCongress is sworn in. Contact the White House and tell Trump using the Congressional Review Act and undoing these regulations is harmful to the American people. Call 202-456-1111, reach him on Twitter or email. Contact Speaker Paul Ryan (R-Wis.) by phone at 202-225-3031, email, Facebook or Twitter. Contact Senate Majority Leader Mitch McConnell (R-Ky.)by phone at 202-224-2541, email, Facebook or Twitter. As always, contact your representatives and senators and ask them to stop using the CRA to roll back safeguards for the American public.